There’s no denying that location based game Foursquare is on a bit of a roll at the moment. The number of people playing the online location based game has rocketed, it recently announced some interesting partnerships with UK retailers and it has Vodafone on board too. And now Foursquare appears to have landed the big one. According to Mashable the company has just agreed a deal with the biggest coffee maker of them all – Starbucks. The actual deal itself isn’t very exciting either for Starbucks or Foursquare addicts. Starting today, frequent Starbucks visitors who check in at retail locations using Foursquare will earn customer rewards. Although there’s no financial incentive or free coffee to begin with, customers can unlock the “Barista badge” after five check ins. There’s no announcement on a UK deal with Starbucks but we bet it isn’t far off. Yet there remains one big question about Foursquare. While there are loads of people playing in London all vying with each other to become mayor of their local coffee shop, are people playing Foursquare in other cities in the UK? So are people playing in other big British cities like Manchester, Leeds and Glasgow? And what about smaller places? Whose mayor of the pier cafe in Lowestoft or of the Bridgend Balti House. Let us know in the comments or vote in the poll. Grab Sizzling Daily Deals up to 90% Discount today! It’s a London thing – or at least a city thing, not a Surrey thing. I’m major of both Costa Coffee shops in Godalming, and one in Guildford. Godalming Waitrose, Farncombe Station, House of Fraser in Guildford and Farncombe Tandori – after only one check in! Plus a couple of others that show too obviously how dull my rural life is. When I lived in Shoreditch, I’d have punched a unicorn to maintain my Mayorship at various wanky places…and of course Whitechapel Road Starbucks. But since moving out to Surrey I haven’t used it at all. My last check-in was actually in Laguna Beach, CA. 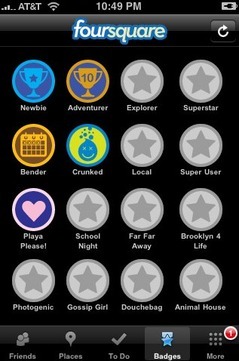 I think that’s a nice play to forever leave my Foursquare heart.